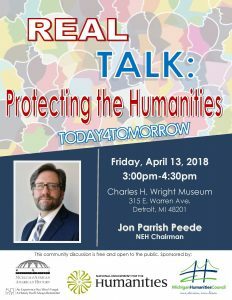 The Detroit Public Library is holding a special session with National Endowment for the Humanities Senior Deputy Chairman Jon Parrish Peede on Thursday, April 12th at 4:30 pm at the Main Branch. Chairman Peede will be meeting library patrons and guests, and talking about the value and importance of humanities. He will also discuss funding opportunities for cultural projects. A second opportunity to meet Chairman Peede will take place at the Charles H. Wright Museum on Friday, April 13 from 3:00 pm – 4:30 pm. His conversation will be called REAL TALK: Protecting the Humanities. 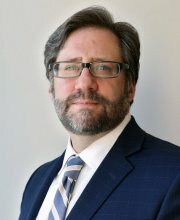 Jon Parrish Peede is Senior Deputy Chairman of the National Endowment for the Humanities. His previous positions include publisher of the Virginia Quarterly Review (VQR) at the University of Virginia, literature grants director at the National Endowment for the Arts, counselor to NEA Chairman Dana Gioia, director of th e NEA Operation Homecoming: Writing the Wartime Experience program, director of the NEA Big Read program, director of communications at Millsaps College, founding editor of Millsaps Magazine, and editor at Mercer University Press with a focus on the humanities. He has written speeches for a U.S. president, a first lady, and a librarian of Congress.